This post features Zanze's offerings for the Month of Games which which runs from July 12th to July 31st. The event will be divided up into three themes: CandyLand for the first week. Chess will be the theme for the second week, and last theme is Clue covering the third week. So first up a a taster is Cotton Candy, a cute little pink two piece top and skirt, just perfect for casual summery days. 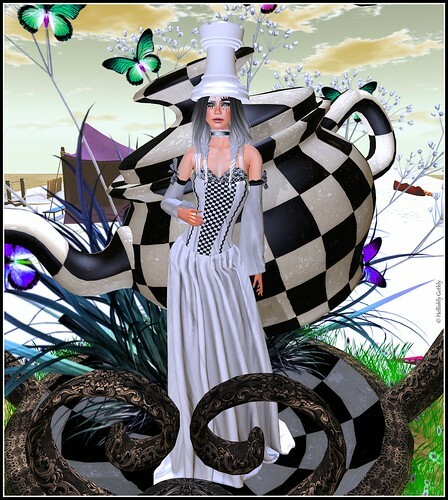 The next offering is the chess themed Chess gown, a long gown with checkered bodice insert, and a white chess piece hat. The third of our teasers is Clue, a delightfully cheeky French Maid ensemble, complete with feather duster.